1 Bukit Utama is a freehold condominium at Petaling Jaya in Selangor, developed by Bandar Utama Development. 1 Bukit Utama comes with 5 blocks of building which comprises of a total of 586 units. The built-up size of the unit measures approximately 1,981 to 2,000 sf in size. 1 Bukit Utama provides a wide range of facilities at the condo such as swimmng pool, wading pool, gymnasium, sauna, cafeteria, children's playground and multipurpose hall. Apart from the facilities provided, the area is also equipped with 24-hour security system. 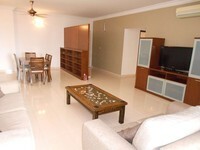 1 Bukit Utama is near to amenities such as college (Bandar Utama College (KBU)). 1 Bukit Utama is easily accessible via Lebuhraya Damansara Puchong (LDP), Jalan Damansara, Lebuhraya Lembah Klang (NKVE), and Penchala Link. Get me good deal if there is any units available in 1 Bukit Utama.